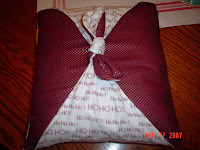 This is a "tie pillow" that I saw completed at my local fabric store. I thought it was quite cute and decided to make at least one for me. I will probably make more as it is so simple. I decided to whip stitch one of the edges so I could take off the seasonal fabric and put on another pillow cover after Christmas.